When I turned 18, I got as crazy as someone with conservative values who was raised by conservative parents is likely to get. I bought a pack of cigarettes (but didn't smoke anything). And I bought a lottery ticket. I scratched it off right there, and I won a couple of bucks. Even now, I sometimes buy a lottery ticket -- just to see what happens -- but I know that the lottery isn't a retirement plan. It would be fun to win, but I've never won more than five dollars, and I know I'm not likely to. The odds against striking it rich with lottery winnings are depressingly high. You can use an online Powerball simulator to get an idea of your odds of winning. The odds of winning the big jackpot at the time of this writing are 1 in 175,223,510. Think of the money you could be spending to try and win the lottery. If a Powerball ticket costs $2, and you buy five tickets a week, you spend $10 a week. That's $520 a year! Over the course of 30 years, that's $15,600. What if you took that money and, rather than trying to fight a losing battle to win the big jackpot, you invested it? Let's see how that would work out. It's true that investing isn't a sure thing. However, your chances of seeing an increase -- rather than just throwing money away on Powerball -- are much greater when you invest. If you put $520 a year (compounded monthly) into a cash product that returned 1.05%, after 30 years your total would be $18,343.34. That's better than spending $15,600 on the lottery. If you are willing to take a little more risk, say putting the money in bonds yielding 3.69%, you could do better: $28,555.56. If you could get an annualized return of 7.5% on a stock portfolio, after 30 years that $520 a year would result in $58,754.23. My colleague Amy Calistri, editor of StreetAuthority's Daily Paycheck newsletter, gets those kinds of returns and better with her dividend-focused investing strategy. Inflation might take a bite out of your earnings, but it would still be better than spending all of that money on the lottery. The appeal of the lottery, of course, is that you could strike it rich and win. 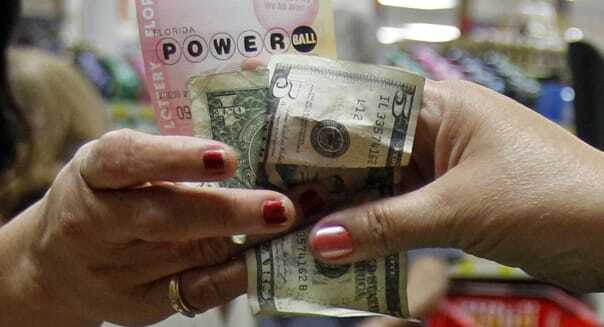 Discovery's WebMATH site points out that one-third of the people living in the United States think that winning the lottery is the only way to become financially secure in life. But, as you can see, you have a better chance of seeing solid returns if you invest. Of course, Powerball isn't the only way to play the lottery. When I play the lottery for fun, I usually buy instant-win scratch tickets. These tickets are a little more fun, and you have a better chance of winning something -- even if that something is only $2 or $3. Let's take the $10-a-week example of playing the lottery, and assume that you manage to win $4 each week. That means that you are only out $6 a week. However, you are still behind. You win $208 a year, or $6,240 after 30 years, but you've spent $15,600 over those three decades, so you're still short $9,360. Instead of earning compound interest for 30 years by investing that $10 a week, you're losing money -- and it's made worse by the fact that your purchasing power is eroded by inflation. That's not to say that you should never buy a lottery ticket. I think it's fun to occasionally spend a few bucks on an instant-win ticket. But I never think for a minute that I'm going to make it big. And I don't "invest" regularly in buying lottery tickets hoping that my retirement dreams will come true when I hit the jackpot. To me, the lottery is entertainment. It's something that I enjoy after all of my other obligations have been paid and if I have money left over for fun. A solid investment strategy, taking into account proper asset allocation, is my long-term financial plan. The Investing Answer: The chance of winning millions and being set for life is a powerful draw. However, your odds of winning big in the lottery are so slim that you are more likely to find a pearl in an oyster or get struck by lightning. Instead of considering the lottery your long-term financial plan, start investing. You can open a brokerage account with as little as $25, and make small investments over time. The power of compound interest is much more reliable than Powerball.